Why advertise your Plumbing business with Plumbers Directory South Africa? 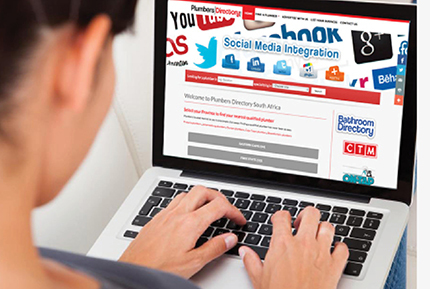 Plumbers Directory South Africa is the most advanced industry specific directory for plumbers and is listed on Google’s first page in your area. Did you know that 97% of people search online before doing business locally and 88% of online searching is done on smartphones. Area specific integration allows your plumbing business always to be seen on the first page of a consumer’s search results on Plumbers Directory South Africa. Plumbers Directory South Africa has the most advanced plumbing business profile listing available on the Internet. Listed with your company name, contact details, website link, Facebook link, direct link to your email address for consumers to email you directly from your profile listing, all your plumbing services, a photo gallery, a video clip and your listing will be one of only ten listings listed on Google’s first page in your area. Your listing is linked with Google maps, making it easier for consumers to find your plumbing business in their search area by utilizing any modern communication devices. You are 5 steps away from listing your plumbing business on Google’s first page! Step 1: Click on the red arrow next to your Province and select your main business area/suburb. Step 2: Fill in your business details and your business address for Google to place your business on Google maps on Plumbers Directory South Africa. After filling in your business details click the next button to take you to the plumbing services page. Step 3: Select your plumbing services. Then click the next button to take you to the media page. Step 4: The rest of the media page is optional. If you do not have a logo or photos or a video clip then click the next button. Step 5: Provide your banking details for debit order run of R199.00 per month. Then select the Terms and Conditions box and click the submit button. Please select all of your relating plumbing services. These services will act as your search keywords. This page is optional. If you do not have a logo, photo or video clip, proceed to the next step. Click Browse... and choose image file on your computer. Web Design By Be Visible Creative Studio | Professional SEO .